After the heavy March rains this year, the butterflies have appeared in greater numbers than usual. I took this photo with my cell phone on a bush walk. A friend of mine, Ian Sharp, is an avid lover of butterflies. Viva Safaris helped in sponsoring a checklist of butterflies compiled by Ian and I used it to identify the butterfly as a Yellow Pansy – hope I am right as Ian will not hesitate to correct me ! The variety and number of butterflies in the Balule Game reserve is quite spectacular. In the various habitat types, many colourful butterflies are seen both on the wing and along waterways. Here large aggregations may be viewed while they are on mud patches busy replenishing body fluids and mineral salts. Butterflies have intricate life cycles ranging from the almost miraculous metamorphic development from an ugly caterpillar through a dormant chrysalis to a beautifully-coloured winged wonder. Once a caterpillar emerges from its egg, it moults 3 or 4 times thus having 4 or 5 instars before forming a chrysalis within the skin of the adult caterpillar of the final instar. The development of the butterfly within the chrysalis can take anything between 14 days to 12 months. On emergence, the butterfly hangs upside down thus allowing blood to be pumped into the wings so as to expand and straighten them. Once the wings are dry, the butterfly can embark on its maiden flight. Butterflies have numerous predators in all stages of development. To avoid predation, butterflies may feed on toxic plants, mimic unpalatable other species and even associate with different insect species like ants for protection. 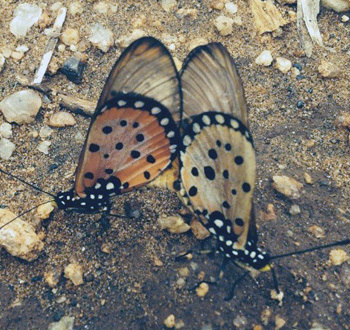 Most butterflies have cryptic colouration so as to be camouflaged. I have been requested by past guests to post a recent photo of the guides. Good to see them all smiling so sweetly ! This month we had heavy rain for three days in a row. Most of the small streams were flowing and some of the small bridges were completely washed away. It was not easy for us do game drives – most of the time we got stuck in the mud. As for the dams around Balule : some are full, some are gone or broken. March is the last month of the Amarula season and most of the animals have started moving towards fence areas like around the lodges. This is because of the marula trees inside the lodges and the animals are looking for the last fruits because they can smell them from a distance. Around Tremisana lodge we used to spot a few elephants in the evening. There were looking for marula fruits and water. A few guests on our luxury lodge program stayed at the Guest House for a couple of days and they were lucky to spot a lioness drinking water from the illuminated waterhole in front of the Guest House. 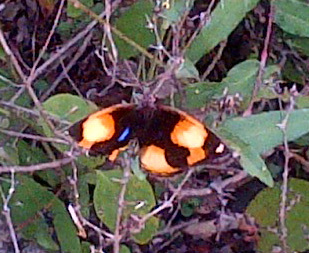 During one of the bushwalks, we spotted a butterfly called an African Monarch. For one of the guests it was something very, very special and enjoyable. The male was flying around and looking for a female to mate with. He found her behind the bushes and flew towards her slowly. The male got close and she dropped on the ground. The male picked her up and started mating while she was almost in a sedated state. The male released a pheromone to make the female feel dizzy so he can mate with her. This was a very interesting sighting of the month. The Olifants River was flowing very fast and the water level was high. From a distance we heard elephants trumpeting and we decided to walk towards that area to find out what was going on. We walked about an hour before we found them, along the way we met with an elephant bull and he ran away from us. We kept on walking towards the river where we heard more noises. We spotted about ten elephants on the other side of the river moving in a westerly direction. I tried to make everyone move faster so that we could view them before they crossed the river. They started crossing the river but most of them they did not make it because the water was very strong and pushed them away. It was only a mother and young son that managed to cross the river. It was very interesting to watch the elephants swimming across the river. We were in between the mother and son but on top of a rock, everyone was comfortable and enjoying the sighting. We stayed on the rock for some time because she was little bit unhappy that the group was left behind on other side of the river. During one sunset drive we went to Oxford. It was a successful game drive and enjoyable. Our first sighting was of a black rhino wallowing in the mud so as to cool down body temperature and trying to protect itself from parasites like ticks. After watching the rhino for a while we drove on to Oxford main dam. Along the way we found one lioness and two cubs feeding on a kudu. When we arrived there was not much left – only bones and skin. The cubs were busy feeding and playing. One of them came close to our Landcruiser. A few metres on we found a buffalo drinking water and it left without getting close to the lioness and cubs. Later we started making our way to Marula Boma for dinner underneath the African sky. During dinner one elephant bull came to join us for a couple of minutes and walked away without giving us any problem. On the way back to the lodge at the airfield there were four lionesses trying to hunt impalas, but all impalas were aware of lions and moved away before they got close. While doing a full day in the Kruger Park we saw a pair of black-backed jackals running around in the open clearing on Kingfisher road. We also spotted a scrub hare sleeping under the bushes. The jackals also saw the scrub hare and started chasing the hare around for about five minutes. The hare then disappeared into a thicket and the jackals lost sight of him and gave up and turned around and changed direction. At the end of the day we came across an elephant bull in musth walking in the road pushing back the oncoming traffic for almost ten minutes. Suddenly an impala ran across the road running at a very high speed close to the bull. The bull got such a fright that he ran into the bush. Everyone was relieved that they could safely continue with their safari. 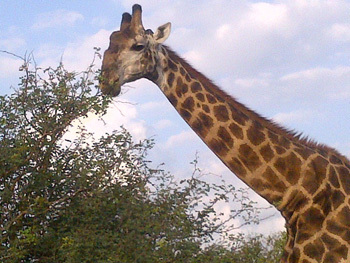 We also came across a lot of general game such as hippos, giraffes, impala, kudu, zebras. On another day in the Park we came across two male lions walking regally on the Orpen road approaching our open vehicles. They passed us at a close distance of two metres. The guests were very excited. The park had a more remarkable surprise waiting for us. While driving on Nwamatsatsa we saw a male leopard walking on the loop busy marking his territory. Marking the nearby bushes and spraying, he was twenty metres from the road. Continuing with the safari we saw a fork tailed drongo fighting a brown snake eagle on a dry wood tree stump. The snake eagle eventually took off but the drongo kept on chasing after him. Later on during the day we came across two European rollers bumping each other trying to catch a locust. The locust fled and the two European rollers kept on fighting. We also came across two tree squirrels mating less than twenty metres in front of our vehicle. We also saw a male lion with a wildebeest carcass at Sweni. The vultures tried to get a share but the lion quickly dragged the carcass away for about ten metres under a tree. It showed the powerful strength of the lion. The vultures waited until they lost visual of the carcass underneath the acacia tree. 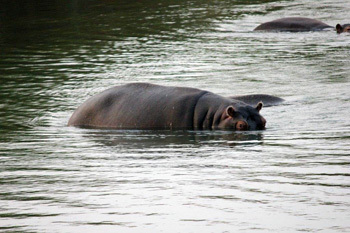 We also came across a lot of hippos at Nsemane. While driving on Rabelais we saw a pride of seven lions. When we got very close to the Orpen gate we came across a herd of elephants. On the 24th of March we saw a rhino bull defending his watering hole from a young elephant bull. They were chasing each other around at Sweni. On the S100 we saw black shouldered kites fighting up in the sky moving like a wind mill down as they came down. When they got close to the ground they separated from each other. On Girivane road we spotted a honey badger close to the road digging a hole on top of a termite mound while the honey guide ( bird ) was busy calling. The day trips to the Kruger national park have provided some excellent sightings – the best would have to be that of the cheetah and her two kittens. After stopping for lunch at Satara rest camp, we decided to head out on a route well known for rhino, elephant and most importantly the occasional cheetah sighting. It did not take long until we were surrounded by a breeding herd of elephants, making their way down to the Nwanetsi River for an afternoon drink. After much splashing about the elephants moved off into the thicker bush out of sight. We continued along the river often stopping to look at congregations of zebra, giraffe and blue wildebeest, that often group together for safety in numbers. The landscape began to change from Riverine forest to wide open expanses of grassland. The chances of spotting a cheetah in the long grass was very unlikely, especially considering how well their coloration blends in with the vegetation, but luckily for us we managed to spot the tip of a tail. After waiting patiently following the movement of the tail, the elegant cheetah decided to cross the road just near the vehicle, to make it even more special she was followed by two very young kittens. 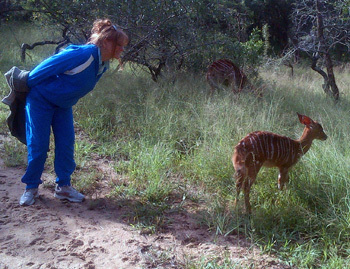 My guests were thrilled to have such a rare sighting and all to themselves it was truly great. The Sunset Drives on Balule provided me with my next best sighting – that of a beautiful big male leopard. Together with Elvis my tracker for the evening, we set out from Tremisana Lodge, with a vehicle full of expectant guests. We started off with a fantastic sighting of giraffe eating away and the ever present impala, but it was after sunset when the drive really became exciting. The spotlight was blazing through the bush, looking to pick up the shine of eyes looking back at us. It wasn’t long before we spotted something on the road ahead of us, which looked very cat like. There in the road right next to the vehicle was the big male leopard, moving along the road spraying his urine onto several trees, before he snuck off into the thick bush. This month has seen me going into Kruger for the first time and although the first few times I was a bit nervous the animal sightings were fantastic with many days coming back with at least 3 out of the big five, all of which were amazing sightings!! All these amazing times will be explained below, enjoy ! This day was the second day I was going into Kruger, the first day nerves had gone and I was starting to get the hang of this. We started in Orpen as usual and headed down towards Satara so that we could get some updates from the other guides and then decide from there. Along the way there are always a few good animals to start with. Shortly after getting into Kruger we found three southern ground hornbills right close to the road just wandering around picking up anything that they found edible. Along with all these wonderful birds we got some nice close up shots of some gnu and impala just grazing close to the road. Now being in contact with many vehicles every day they become rather tame towards the car ( compared to animals in Balule ) and this allowed us to get very close for some nice photo shots. We started making our way after spending some time with them and not even 2km down the road were some beautiful elephants having some fun in what looked like an old mud hole only big enough for one elephant at a time so they all took turns. But of course it was a case of respect your elders, as the matriarch was the first to go in and took her time in the mud. We headed off again down the tar road driving until we got to a river bed crossing but we saw quite a lot of commotion there with many vehicles all trying to squeeze onto the bridge .We did not know what it was but we knew it would be good so we dashed off in that direction and to our joyous surprise we found two lions a bit of a distance off in the river bed under a tree just lounging around and having a good time. Our moment was very short lived as the amount of cars made it difficult to get a view, being guides we knew they wouldn’t move far so we could always come back later. We also heard from another guide that near our lunch area was a male and female lion mating so Texson and I ( we had 2 vehicles in the park that day ) sped off in that direction but taking it slow as we went and stopping for many animals along the way getting beautiful kudu, waterbuck, a few beautiful birds here and there but nothing more exciting than that. We decided to stop for lunch before going to the lions as it was very hot and all the guests were tired and also it gave us a chance to gather any more information about sightings in the area before we set off. At around 2pm we set off on our journey again and headed straight to the lions area again stopping for some huge male waterbucks and getting some pretty good photos of them before once again going to the lions. From a distance we could only see one car which was perfect for us and as we got there we got the prime position viewing them 5 out 5 and while we were there they even gave us a show by mating no more than 2m away from the car. After viewing them for a while we headed down the Sweni road and found some huge herds of elephants with tiny babies no more than a few weeks old. About 100m away from them we found some daga boys (old buffalo bulls) just standing behind some thicket not giving us an amazing view but a good sighting none the less. After all that excitement in the morning the afternoon got a bit quiet and nothing extremely special was around but we had amazing sightings throughout the day and all of which allowed for great photos! All and all it was a great second day in Kruger for myself and the guests as well. I really enjoyed it a lot, the bush is getting more active as winter approaches and sightings are getting more and more amazing. On the 1st of March I picked up my guests from Ezulwini Lodge around 10am and checked my guests in at the Guest House of Tremisana Lodge. As we entered Orpen gate in Kruger National Park we were welcomed by the impalas fighting as rutting season has just started. The male impalas were fighting for dominance. Down at the Timbavati river we saw a black rhino cooling itself in the shallow water. We had a very clear view of the surroundings. A huge male elephant was on the other side of the river grazing and walking slowly towards the river. We drove for about five minutes and we came across a pair of mating lions resting in the middle of the road. The other pair was about two metres away from the road not far from each other. It seemed as though the male ones were siblings. It was my first time to see two couples of mating lions so close to each other. Usually during mating time they move away from the rest of the pride for about a week. The other couple that that lay along the road moved deep into the bushes after mating. We left the lions after thirty minutes. Still on Orpen road before Nsemani dam we saw a male giraffe scratching himself on the magic guarri tree to remove some ticks. At Nsemani dam we saw a lot of general game and we managed to see elephants swimming in the water. We spotted a rhino from the other side of the dam under a tree taking a rest. After taking a swim all the elephants left the Dam. We waited until they crossed the road being led by a female elephant. We were also lucky to see three lionesses just relaxing very close to the road after we left the elephants. On our way back around 5pm we came across the same pair of mating lions still at the same place. We were lucky the moment we arrived they were walking along the road causing a traffic jam. The clients jokingly asked if I could change the lions into a leopard because it was the one left out of the big five. To compensate we saw a hyena crossing the road. On the third of March it had been raining the previous night at Marc’s Treehouse Lodge. We left the lodge in the rain and it continued raining until we arrived at Kruger National Park. When we started the drive in the park there were only light showers. On Orpen road after Rabelais we came across Wild Dogs that had just killed an impala. Nothing much was left. The Wild Dogs were all over the place with some pieces of meat in their mouths. Some were chasing and biting each other to have a share of the meat. At Sweni road around 1.30pm we saw a blue wildebeest with a tumour underneath its neck the size of a basketball. It looked very thin and having difficulties to graze and walk. It was a very good morning a bit overcast as we made our way to Kruger National Park. When we got to the park the sky started to clear up a little bit. All of my guests were interested in seeing a big male lion and I was very keen to show them one. We started with Rabelais to check if we could be lucky but we only saw four male buffalos willowing in the mud. Towards Bobbejaanskrans we saw one white rhino bull grazing thirty metres away from the road and everyone was very excited because it was very close to the vehicle. We continued with our journey and once we got to Nsemani dam we found three elephants swimming in the dam. When we left Nsemani dam it was around 12h00 and we decided to check Timbavati picnic spot before going to Satara camp. About two hundred meters before Girivani turn off we saw we saw three vehicles standing on the road. When we arrived at the spot we saw that one female lioness was lying in the road. As we went closer we saw two big male lions coming towards the road from the bushes. Their mouths were full of blood but we did not manage to see the kill because of the bushes. This day we managed to see the big five in Kruger National Park and the sightings were awesome. We started by seeing six buffalo bulls at Orpen gate about 1,5 kilometres from the entrance. As we continued we saw a breeding herd of elephants just before Talamati turn off crossing the road. Further on we saw one White Rhino grazing next to the road. While driving on the S126 about eight kilometres we saw sixteen lions on a blue wildebeest kill with seven cubs but only bones were left as the rest of the carcass was finished. On Satara main road towards the S90 we saw a leopard in the tree. The sighting was not good because there were lots of cars but later on the visual was good because some of the cars moved away. While doing the sunset drive in Balule I started at Oxford towards the game wardens house on the hill and we saw seven giraffes, zebras and two male elephants. Wesley called me on the radio and informed me that there were lions on Nonwane property and I went down the hill and saw two waterbucks fighting. We stopped for a while and watched them. When we went to Xibhedjana dam, east of the dam we saw three female lionesses with seven small cubs about three weeks old. It was already past seven and it was getting very dark. We did not shine them much with the spotlight but we could see them jumping around and some were feeding from their mother. 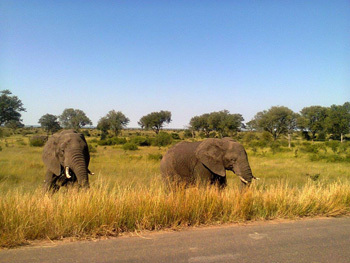 At our dinner bush braai place, Marula Boma, we had a big breeding herd of elephants surrounding the Boma. On our way back to the lodge while driving near the open plain we saw two jackals chasing a scrub hare but they failed to catch it. On this day I had nine pax for the bushwalk and we managed to see a lot of giraffes, zebras, kudus, waterbuck and impalas. At the river we saw a small crocodile approximately 1,5m long basking in the sun. On our way back just before the power line we saw a big male elephant walking on the road. We started slowly and cautiously following the elephant until he went out of the road and we could drive past him. In the afternoon during the afternoon drive we saw one female with two cubs on a kudu kill. Once again Mother Nature has proven to be kind to us, having seen all the big five and many other great sightings of hippos, crocodiles and my first Nyala antelope on the reserve. Quite an event – seeing I have spent all my life here! After being in the bush for over two hours and only finding a breeding herd of impala and one giraffe, it’s needless to say that our hopes were not high. Nevertheless it was once again proven that patience is what the field of this profession is all about. A big leopard 50m away from us was right in front of us. Hopelessly trying to calm down the excitement we moved closer and luckily for us he was on the hunt. He was not even slightly bothered by us and continued moving towards the masses of impala, trying to catch some rest on an open clearing towards the dinner spot. Even though he never managed to make the kill, it was amazing to see the behaviour of the two parties in a life and death situation. The early morning bushwalks have been fantastic for animal sightings. It was cold, and very early in the morning. Everyone was half asleep but the atmosphere was about to change. Just after sunrise on our way to the walking site we suddenly saw a big animal moving behind the thickets. At first we thought it would be a young elephant bull, but as he moved into a more open area we had a perfect view of one of the oldest black rhino bulls that likes to move through the area. It was extremely exciting as it is one of the endangered species to find and obviously one of the big five. We had a good view of him for about a minute before he moved back up to the hill tops. Moving on, we were now about ten minutes from the walking site and running a little late. On our last turn off we managed to encounter some traffic. We came across a lioness with little cubs, very relaxed and also a little bit sleepy. We managed to get within 6m from them and managed to get beautiful pictures. Our last bushwalk for the month and what a way to finish off for the month!! There was a lot of excitement in the air as the guests had a great sunset drive the evening before and therefore knowing what’s out there to see. We were also trying out a new walking site. Once again on our way we came across a lot of impalas, warthogs, giraffes and two lionesses on an early morning hunt. Both were constantly snuffing and smelling where possible prey was. As they moved on through the thickets we left not wanting to disturb the hunt. We got to our walking site close to Olifants River and right away we picked up fresh rhino and leopard tracks so we were all alert and started following tracking the rhino tracks. We had a great view of two massive hippos resting in the river and picked up some fresh buffalo tracks moving in an easterly direction in front of us. We started losing his tracks but very shortly afterwards we heard a snort and movement down in the dry river bed. It was perfect as we were brilliantly safe on a higher embankment but still only fifteen metres away from a massive buffalo. He stopped and had a good look at us and ran up on the other side of the embankment. Tremisana Lodge has been spruced up. We have engaged our long-time friends, Wynand and Gerda Britz, to improve the overall appearance of the camp. They were our neighbours during the period Wynand was Warden. Gerda has also given a recipe or two to Delina and we all enjoyed a typical Afrikaans “pot dessert” on my last visit to Marula Tree Boma. Tremisana Dam is still full and a 2 metre crocodile is now in residence. We are not sure as to how many fish there are in the dam. Pieter caught some Tilapia at Marc’s Treehouse Lodge and released them at Tremisana Dam. Nyarai informs me that the staff have stated giving the rooms a fresh coat of paint as well as new mosquito nets on the windows. Marc’s Treehouse Lodge is benefitting from Janetta Viljoen’s input. Treehouses 1 and 10 have had their roofs completely rethatched and, as a result of the copious rains this month, we have added some safety features along the paths. The paths get very muddy and slippery after big rains so additional bridges and wooden supports are most welcome. A new bridge has been built over the stream to treehouse 1. We had a brief visit from a pack of around 15 Wild Dogs early in the month and I understand that they have crossed the road into Maduma Boma lodge where they have wreaked havoc among the antelope there. It is quite a problem insofar as a pack this large can cause a major financial problem. Being endangered, the Wild Dogs cannot be shot and our neighbours are hoping and praying that the pack will move off soon. 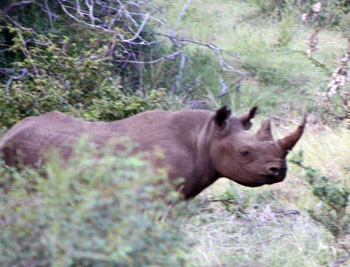 Ronald reports that there have been regular sightings of a herd of 20 buffalos as well as 6 White Rhinos on bushwalks. He also tells me that the guests that have breakfast at Breakfast Dam are always thrilled to see monkeys and nyala at such close quarters. We had an excellent month – thank you for the support. In fact, the first time we did not have guests arriving from Johannesburg since we started the Marula Boma braais on 1 January was on 30 March ! 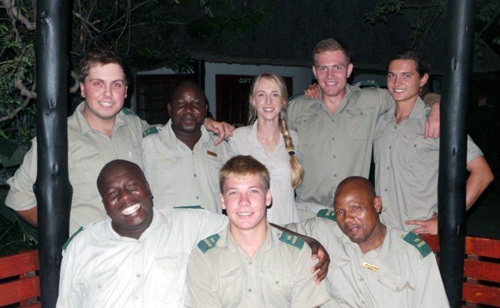 I recently spent an enjoyable evening with our main travel partner supporter and was told that the feedback he has had is excellent – the guests are raving about the “ incredible Bush Braai at Marula Boma”. I thank the staff who so meticulously prepare the place that elicits the amazed reaction of our guests. 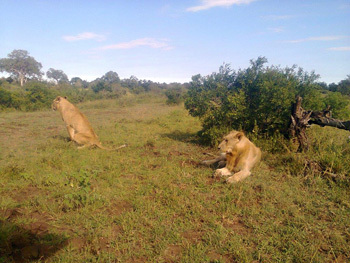 What also emerged is that our guests on the 4 day Tremisana safari package are seeing lions almost every safari. This is happening because of the diversity of our product. It sometimes happens that a particular game viewing region goes quiet for a few days. However, because Viva Safaris conducts game drives on three different reserves (Balule, Tshukudu and Kruger) the probability that all three are simultaneously quiet is almost zero. Very accommodating staff. Monkeys And Nyala run rampant. Above the average tree house. Food was decent. Guides were good. Drinks were great priced. Would have liked to have more fenced in tree house but remember a tree house is literally a tree house. Needed a private flight to Joburg & the staff helped me to the greatest extent possible. free wifi is the highlight. Thanks for a lovely stay.